Summary. Living organisms are commonly classified in a tree-like pattern based upon a presumed nested hierarchy of traits. The fact that scientists have been able to arrange living organisms into a branching classification has been used as an argument in support of common ancestry. Such a pattern is expected on the assumption of descent with modification, and no other theory is known that predicts a tree-like pattern. Traits that do not fit the pattern of a tree are common, but are regarded as anomalies, producing noise in the data. Anomalies are often explained away as due to gene loss, horizontal gene transfer, convergent evolution, or other causes. Comment. Much effort has been expended in attempts to arrange living organisms in a pattern based on genealogy. Phylogenies produced by these methods are tree-like in structure. However, the tree-like pattern is not as evident as evolutionary theory would predict. There are many exceptions to the expectation of hierarchical nesting of traits. Among prokaryotes, the pattern is so inconsistent with a nested hierarchy that many scientists have abandoned the idea of a grand “tree of life,” at least for prokaryotes. Many scientists still hold that multicellular animals (metazoans) produce a consistent tree-like pattern. However, even among metazoans, inconsistencies are so common that it has been necessary to use a special word - convergence – to refer to them Advances in molecular biology have greatly increased the frequency of detection of evolutionary anomalies, to the point that many evolutionists are looking for a better theory. In evolutionary theory, organisms that evolved from a common ancestor would be composed only of modules derived or modified from its ancestors. The resulting pattern would unavoidably be a tree. Anomalies would logically falsify the specific tree unless a good explanation can be found. Yet, despite the repeated apparent falsifications, the presumption of common ancestry is rarely if ever questioned. There is no alternative available to scientists with a materialist philosophy. This paper by Ewert suggests a new approach that may prove more fruitful. We might say, paraphrasing Eldredge and Gould: “anomalies are data.” Ewert’s contribution here is to provide an explanation for the anomalies that does not depend on ad hoc justification, but emerges as a prediction from his model of modular design. Ewert’s proposal allows the possibility that an intelligent creator could have had a large number of modules available which could be mixed and matched to construct different kinds of animals. Some modules might be used in many species, while other modules might be restricted to a small group of species, or even a single kind. By arranging modules in different combinations, the intelligent creator could make diverse kinds of organisms. It would be possible for a taxonomist to select modules that produce a tree-like distribution pattern in the organisms studied, but there would be a large number of modules that would be distributed in various ways inconsistent with a tree. This model of modular design would predict both the tree-like pattern and the “anomalies” that do not fit the tree. Features that are interpreted as anomalies in the evolutionary tree model are easily explained in the dependency graph model as modules shared with other taxonomic units due to common design. One might compare the idea of modular design to the children’s toy known as “Mr. Potato Head.” Here, different parts can be mixed and matched to produce a variety of different play faces. 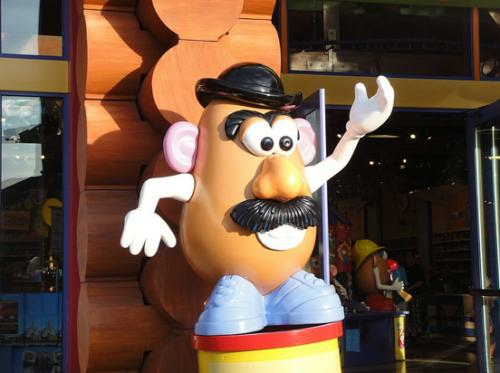 Different “potato heads” share modules, and might be arranged in some kind of artificial “evolutionary tree,” but they do not have a history of common descent. Instead, they are produced by common design. Another metaphor for modular design is the grabbag, filled with multiple interchangeable parts. This was suggested by Stephen Jay Gould, who was noted for his passionate opposition to creationism and intelligent design. Gould compared the evolution of Burgess Shale animals to a process in which a “Great Token Stringer” selected parts from a “grabbag” with a series of compartments, producing a set of animals with mixtures of traits that do not fit the expected hierarchical pattern. Perhaps Gould was more correct than he intended to be. It seems that the grabbag model, much like the potato head model, is more successful than common ancestry in explaining the patterns seen in biodiversity. E.g., Pigliucci and M, GB Muller (eds; 2010) Evolution: The Extended Synthesis. Cambridge, MA: MIT Press; Shapiro, JA. (2011). Evolution: A view from the 21st century. Upper Saddle River, NJ: FT Press Science. Eldredge, N and SJ Gould. (1972) Punctuated equilibria: an alternative to phyletic gradualism. Pp 82-115,in (TJM Schopf, ed) Models in Paleobiology, San Francisco: Freeman Cooper. Their dictum “stasis is data” has become a classic. Archaeopteryx is arguably the most famous fossil ever discovered. It has a mixture of bird-like and reptile-like traits, and was first reported only two years after Charles Darwin published his book, The Origin of Species. Since then, another eleven Archaeopteryx specimens have been recovered from the limestones near Solnhofen, Germany.